Geeky Pleasures interviews Carrie Vaughn (podcast). Skiffy and Fanty with Jennifer Pelland (podcast). Twisted SciFi interviews Mike Allen. Fantasy Book Critic (Mihir Wanchoo) interviews Geoffrey Wilson. Salon (Five Books, The Browser) interviews Will Self. Amelia Beamer on The Cost of Encouraging, or, Thar Be Dragons. Spec Technique on A thoroughly non-racist kerfluffle. N.K. Jemisin on This is how you destroy something beautiful. io9 (Charlie Jane Anders) on Weird Tales Magazine faces a boycott after endorsing a “thoroughly non-racist book”. Genreville (Rose Fox) on Weird Tales Goes Back in Time. Matthew Cheney On Weird Tales. Shaun Duke on The Weird Tales / Save the Pearls Fiasco: Preliminary Reactions. Jeff VanderMeer on Weird Tales, Ann VanderMeer, and Utter Stupidity. 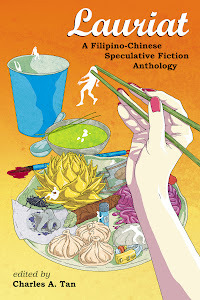 Weird Fiction Review (Rochita Loenen-Ruiz) on Hunting for Stories in the Philippines. Bryan Thomas Schmidt on 10 Tips For Getting Past Writer’s Block. The Qwillery (E.J. Swift) on Opportunities and challenges in writing about climate change. Jim C. Hines on The Last Airbender Movie and Cultural Appropriation. The Night Bazaar (Courtney Schafer) on It’s All About Priorities. bare•bones e-zine (Peter Enfantino & Jack Seabrook) on Batman in the 1970s Part 32: October, November and December 1974. Smart Pop Books (Geoff Klock) on Frank Miller's New Batman and the Grotesque. Locus (Mihai Adascalitei) On Romanian speculative fiction. BBC News Magazine on Is Alice in Wonderland really about drugs? Ian Sales on Judging by its cover. Lawrence Person's Futuramen on Happy Birthday H.P. Lovecraft! Barnes and Noble Review (Paul Di Filippo) on Birdseye Bristoe. The Functional Nerds (Catherine Russell) on Debris by Jo Anderton. Justine Larbalestier on We Can’t Control Anyone But Ourselves. Omnivoracious (Susan J. Morris) on Don’t Poke the Editor: Six Deadly Don’ts (and Dos) for Dealing with Editors. Paul S. Kemp on The Sundering. Aliette de Bodard on Cultural Appropriation. World War Z - The Battle of Yonkers. Awesome Fantasy Illustrations by Caravan Studio. Surreal Art – Igor Morski. Star Wars Trilogy Posters In The Style of Spaghetti Westerns. Space Journey on Martin Faragasso. Response to Weird Tales — Shimmer is now paying pro rates. Barnes & Noble’s Nook Comes to the UK in October. 13th Century Church Gets New Life as a Bookstore. The New York Review of Science Fiction Readings presents Richard Bowes Carlos Hernandez.